This hack is very similar to person701's Hard Mode. I've played his hack and had ideas to improve it a bit, but most of them he didn't liked and version 2 of his hack wasn't done, so I decided to make my own more harder version with blackjack and hookers. I've just finished first Prime, so there will be a few features from it. 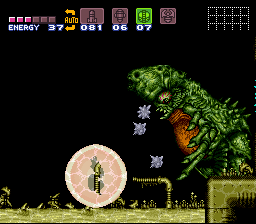 Well, I'm not a first one and not a last one who've made a hard version of Super Metroid. If I am right, the very first 3 Super Metroid hacks (even before first SMILE) were Hard Version (by Ir0n_BeasT), Extreme Edition (by Dark Knight Kain) and Justin Bailey hack. The goal is to create a more harder version with ASM changes to better fit the gameplay and do so with small size of patch. Every Missile upgrade gives you 2 Missiles. Every Super Missiles upgrade gives you 1 Super Missile. Every Power Bomb upgrade gives you 1 Power Bomb. To open pink doors, 5 Missiles are need as usual. Hope that'll make them more useful. Missile pickup will give 1 Missile instead of 2. Most of sequence breakes are turned to sequence brakes (read: removed). I tried to alter levels minimally and left the same count of items and doors (except a few grey doors more), but prevents player from sequence breaking. Mockball and Wall jump techniques are still there. NBMB running isn't possible now. Lowest rate to complete the game is 33%, I believe. Perhaps, a little less for a TAS'er, but I doubt. Spore Spawn is the strangest boss. You'll have to dry it off. Golden Torizo is much more dangerous than before. Space Jump is strongly recomended. To enter sand area in Tourian you'll have to collect enough Super Missiles. Beware of evil sentinels! 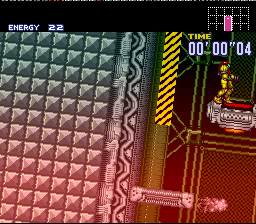 Energy drop subroutine when Samus has low health is tweaked. Escape in Metroid style (you'll understand when you see). And before you ask, yes I've passed my own hack with 100% and 03:03. I haven't speedrun too much. Best escape time from Ceres is 0'03''87, from Zebes is 0'20''43 (with saving animals).